The Office of the Ports Authority Commissioner has concluded investigations into a boating accident that occurred on Christmas Day in the New River, near the Lamanai Maya ruins, when a boat carrying ten tourists who were on a river cruise to the Maya ruin capsized. No one died, but the tourists suffered minor injuries and all their equipment was lost. The investigation determined that the captain of the vessel was at fault and charges have been levied against both the owner of the boat and the captain of the boat. The owner of the boat was given two charges — allowing the vessel to travel without adequate crew, and allowing the boat to be piloted by a captain who did not have the requisite license. The owner conceded to the charges and made an out-of-court settlement. Four charges were imposed on the captain — piloting a vessel without the requisite license, piloting a vessel without requisite crew, disobedience to regulations, and negligence. Ports Commissioner Merlene Bailey Martinez told Amandala that the captain has not yet indicated whether he will settle out of court. She said that this is an isolated incident and that there is no fear that captains are mishandling and jeopardizing the lives of people. However, regular checks will be made and Ports Authority personnel will be in the area of the Maya ruins to ensure safety procedures are carried out, but how frequently such checks can be made cannot yet be announced said the Ports Commissioner. Four passengers who were onboard the boat when it overturned have lost all their belongings, including their cameras, along with a large bag of souvenirs and their identification documents. They are still suffering nightmares about the terrible experience, they said. The passengers reported that they have not yet been contacted by the authorities or the company, but they will be doing all they can to recover their losses. According to CTV3, at about 2:00 p.m. on Christmas Day, a group of ten US tourists from the Norwegian cruise ship travelled to Orange Walk for a river cruise to the Lamanai Maya Ruin on the New River in Orange Walk District onboard a 25-foot boat called the FU Dee River. Shortly after they departed from the Maya ruin, a large boat that was speeding past them produced large waves that slammed their boat, causing the captain to lose control, and the boat overturned. Tours guides in the area saw what happened and quickly responded, rescuing the tourists out of the water and taking them to safety. Not all the passengers were wearing a life vest. The company dispatched another boat to the scene, but the tourists were already rescued. No one was seriously injured, but some tourists suffered minor bruises, scrapes and scratches. . 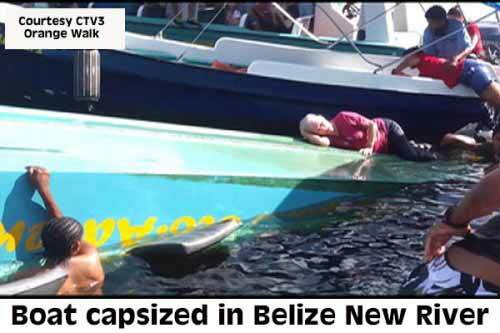 The tourists reported that when the first wave slammed the boat, it hit the boat so hard that it sent them in the air, and when they came down, then the second wave hit the boat, and that was when the boat flipped over in the air, trapping some of them in the water under the boat. One of the survivors, Lucy Lekarczyk, in an interview with CTV3, said that they were lucky that there were no children on the boat at the time. Her father-in-law, she said, who couldn’t swim, managed to hold on to the front part of the boat, because there was nothing for them to grab on to. Verbal statements of the incident were given to police. The Ports Commissioner said that they do not cover compensation, and it will be the responsibility of the company to compensate the passengers.